Injuries always play a key role in determining the success of any team in the Stanley Cup Playoff. The Penguins lead the way with the Kris Letang injury, but the Nashville Predators had their fair share of injuries too. The name Ryan Johansen might right a bell. These injuries necessitate callups. In the Penguins case, those callups come from WBS. 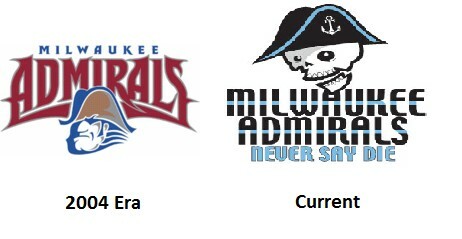 For the Predators, their callups come from a team called the Milwaukee Admirals, the other Ads team (Norfolk will always be the Ads to me). Five players from the Ads this season went on to play for the Predators: Juuse Saros, Frederick Gaudreau, Austin Watson, Pontus Aberg and Matt Irwin. For most Penguins fans, this is an obscure Pierre McGuire level piece of trivia. An AHL team in Wisconsin is probably something that most Penguins fans are largely ambivalent towards, like the Predators until 2017. The WBS Pens and the Ads have beef. It’s old beef, but beef nonetheless. I loathe the Ads, and their fans, and by extension the Nashville Predators. The Milwaukee Admirals occupy a special place in the WBS Hall of Playoff Horrors. I, for one, couldn’t be happier that their fans were not able to see their callups help the Preds win a Stanley Cup. Remember 2004? 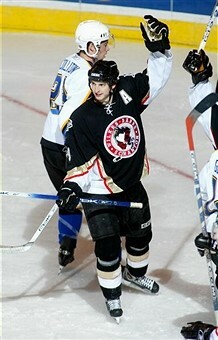 The 2003-2004 WBS Penguins were a special team. They had all three individual players received from the Jagr trade to Washington (Ross Lupaschuk, Kris Beech, and Michal Sivek). Try as they might could not equal a gestault Jagr. They had skill up front from proven AHL talent like Toby Petersen and Tom Kostopoulos and NHL bound forwards like Tomas Surovy and Colby Armstrong. 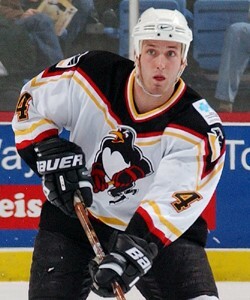 It seems like only yesterday Armstrong was lighting it up in WBS and not a studio man. Future defensive stallwarts Rob Scuderi and Brooks Orpik patrolled the blueline. Orpik, before he was corrupted by the dark side. In net they had Andy Chiodo who was having a career year and carried the team at times on his back into the Final backed up by some scrub named Marc-Andre Fleury who played quite a bit in the Final. So what happened? In case you weren’t around for these games or have managed to erase the terrible memories of their last playoff match-up, let me go through the (low) highlights. The Penguins had made it to the Calder Cup Final for the second time in team history. Instead of a hard fought competitive series, the Pens were straight up curb stomped by the Ads in 4 games. 2004 was a long time ago, a time when the Milwaikee Admiral had not yet died and turned into a skeleton monster that haunts dreams. Game 1: WBS loses 2-1 in OT in Milwaukee. Close but no cigar. Game 2: WBS collapses. 8-4 in Milwaukee. The series isn’t over until you lose a home game. Game 4: WBS loses 7-2 in WBS in a game in which Chiodo was pulled, then MAF was pulled, then Chiodo was pulled again. Sigh. Here are the final seconds of game 4 as the Ads win in Wilkes-Barre 7-2. If you listen closely you might hear a younger collegiate me weeping in the background. This is a series that has stuck in my craw for a long time. Every time someone casually mentioned the Nashville callups from the Ads, I was immediately taken back to 2004 and the painful, painful memories. This revenge was a long time coming and the Penguins defeat of the Nashville Predators was more than suitable recompense in the eyes of this WBS fan for the 2004 Calder Cup Finals.